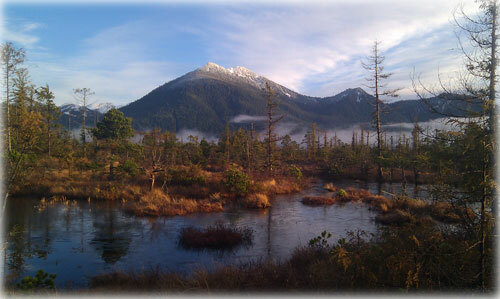 This photo of Deer Mountain was taken just north of Judy Hill on Gravina Island. Not visible in the photo and below Deer Mountain is Ketchikan. The photo was taken with an iPhone. Ketchikan: The Patriot Flag Coming to Ketchikan December 23rd - In cooperation with The World Memorial, a non-profit charity, the Ketchikan Fire Department announced that it is proud to have been selected to help in honoring those who perished in the attacks on the World Trade Center on September 11, 2001. 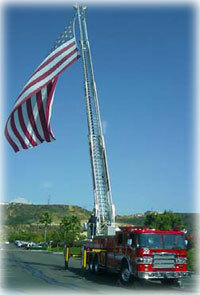 As the Patriot Flag tours our country, it will send a message to the world and the families who lost loved ones on 9/11/01 as “UNITED WE STAND and WE HAVE NOT FORGOTTEN” is the Flag’s theme and message to all. On December 23rd, between the hours of 10:00 AM and 2:00 PM, The Patriot Flag will fly near Ketchikan Fire Station #2 (3352 Tongass Avenue), weather permitting. Alaska: Knik Arm Bridge Gets Fed Approval - The Federal Highway Administration has signed a Record of Decision to allow the building of 19 miles of access roads and the construction of a toll bridge across nearly three miles of Alaska’s Knik Arm, connecting the Ports of Anchorage and MacKenzie. Congressman Don Young (R-AK) said in a prepared statement, "This has been a long time coming. It has been five years since SAFETEA-LU was signed into law, and at last we are realizing a vision. This project has endured environmental reviews, negotiations, and years of development but now we are finally ready to put the shovel to the ground and start developing Alaska for the betterment of our residents and the future of the state. When I wrote the highway bill, I included $230 million for the Knik Arm Bridge because it had been a transportation priority for our state for decades and I was in a position to make it happen." Alaska: States Announce $13.25 million settlement with DIRECTV - Acting Attorney General Richard Svobodny announced Thursday that Alaska and 48 other states and the District of Columbia have reached a settlement with DIRECTV to resolve claims of deceptive and unfair sales practices against the satellite television provider. Alaska: Alaska Joins in Settlement In Dannon Advertising Case – The State of Alaska is among more than three dozen states that have jointly filed settlements with The Dannon Company, Inc., regarding deceptive advertising for its Activia and DanActive products. Alaska Science: Gaseous dinosaurs and surging glaciers By NED ROZELL - The emissions of northern dinosaurs may have led to a warmer planet 70 million years ago, said a scientist attending the 2010 American Geophysical Union Fall Meeting in mid-December. The cracked-up back of surging Bering Glacier, taken in early fall 2009 about 10 glacier miles upstream from where it ends at Vitus Lake. The whitish mountain in the far background is Mount Saint Elias. Dinosaur hunters have found preserved footprints of hadrosaurs in rocks all over Alaska, including: Denali National Park, near the Colville River north of the Brooks Range, at Aniakchak National Monument and Preserve on the Alaska Peninsula, and in Yukon-Charley National Park and Preserve. Tony Fiorillo of the Museum of Nature and Science in Dallas, Texas started thinking about all those hadrosaurs being plant-eating dinosaurs as large as elephants and their nickname, bestowed by paleontologists: cows of the Cretaceous. At AGU, Fiorillo presented his idea that hadrosaurs were spread across the landscape at numbers comparable to today’s caribou, a calculated “standing crop” of 500,000 hadrosaurs in Alaska 70 million years ago. Cape Fox Corp bidding troubles By A. M. Johnson - Congratulations to ProPublica! This is the quality of investigative journalism the "Old" journalism schools taught. Clover Pass Community Church's 'A Singing Christmas Tree' By Shirley McDonald - I just wanted to thank Clover Pass for putting on yet another spectacular performance. Even tho last year was my first year of getting to see it .... I keep telling myself I will never miss another and thank goodness they do it for 3 days so I have a good running chance at it! - More..
KCCB concert By Judith Green - The concert today given by the Ketchikan Community Concert Band was once again a wonderful way to spend a Sunday afternoon. - More..